RESIDENTS have voiced concerns over traffic and drainage in a question and answer session on Oxford’s biggest planned housing development in a generation. On Thursday night, residents and councillors had the chance to quiz planning officers over the planned 885-house development on land west of Barton, north of the A40 and south of Bayswater Brook. The application, which was submitted by Oxford City Council and developer Grosvenor on June 3, also has plans for a new primary school, a park, retail space, a potential hotel, community sports pavilion, two children’s play areas, communal gardens, allotments and an adult sports pitch. Residents and councillors raised concerns about the extra traffic the development would create, the proposed sewerage and drainage system and the road linking Barton West and the Northway estate. But many said they were not satisfied by the responses from city council planning officers Murray Hancock, chief principal planner, Nick Worlledge, conservation officer and Michael Crofton-Briggs, the head of city development. Ms Bennett said her main concern was that the proposed drainage suggestion using marshland and ponds was not adequate. Marston councillor Mick Haines said he was “deeply concerned” about the extra traffic the development could generate. Two petitions have already been given to the city council by Mr Haines, who is an independent. A petition of 582 signatures was received regarding the additional traffic in the Marston area, while a second of 935 signatures relates to concerns about flooding and sewage issues in Marston and Old Marston. Northway Residents’ Group chairwoman Jane Cox said the bus access point linking Barton West with Northway could “devastate” the estate. In the proposal, the link road can only be used by buses and emergency vehicles. At the session, council officers said the system would be enforced properly by introducing rising bollards and bringing in automatic number plate recognition cameras to stop motorists abusing it. But many of the 18 residents at the session remained unconvinced by the proposal. 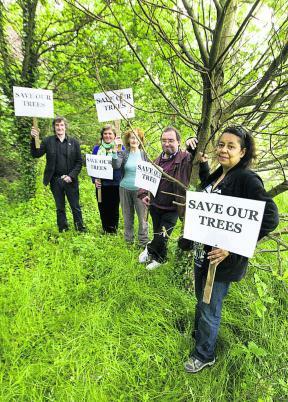 Georgina Gibbs, who lives in Saxon Way, Northway, said: “There must be an alternative. There are huge concerns about opening up that entrance on to the A40, especially for young children. The east area planning committee will meet at Oxford Town Hall on Tuesday, September 24, to decide whether to approve the scheme or not. Developer Grosvenor was unavailable for comment. Traffic through Old Marston village is already at a standstill. From Cherwell Drive down to the bypass there is a rat run through the village. The current proposed drainage suggestion using swales (a type of marshland) and ponds is not adequate. Where will this waste go? This will devastate Northway. Why do we want another crossing on the A40 when it’s already a disaster? It’s shameful. There is nowhere near enough affordable housing and there is only 40 per cent proposed in the development. MANY people, including myself, have always supported the tireless and good work that Councillor Mick Haines has, for a long time, done for the residents of Marston and the surrounding area. He has become the people’s champion, as he always supports their concerns and looks after the welfare of the area. Despite all his good work, there is always someone to criticise him, probably due to the fact that he is such a popular figure. 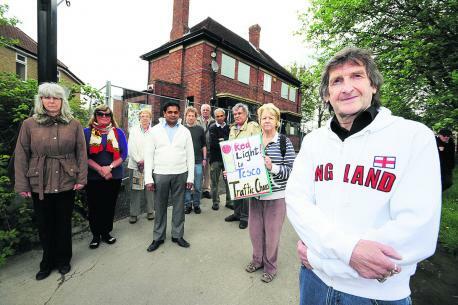 Roy Darke is one such critic who accuses him, of ‘not doing his homework’ on the local residents’ views on lighting across Croft Road recreation ground, claiming that only the minority of residents in Croft Road and Rippington Drive supported the scheme. I know for a fact that Cllr Haines went round to Stainer Place in particular with a map and explained the situation thoroughly to residents regarding the lights. The vast majority of residents apparently were satisfied that everything was explained to them correctly. I am writing in response to (Path is on track, July 9, pictured, and (Bollards plan, July 19,). It is wonderful news that the cinder track connecting Old Marston to the cycle track into the Science Area of Oxford is to be surfaced imminently. The Oxford Mail article (July 9) states this stretch as a “cycle track”. This is incorrect. For many years it has been a footpath only, becoming a popular cycle option after the Oxford cycle track was installed alongside the University Parks from Parks Road. I believe that it is imperative to display adequate signage after surfacing to remind both cyclists and pedestrians to show empathy and take care when accessing this shared space. Mary Clarkson (Letters July 19) suggested there would be a meeting to sort out concerns regarding installing additional bollards on the Parry Close footpath to increase pedestrian safety. Ideally this meeting must include the signage issue and also discover who is responsible for the wooden crossing bridge at Parsons Pleasure (Marston end). Part of the balustrade is decaying. It needs repair and TLC as many young children cross this bridge. Finally we must not forget the sterling work of Mick Haines – Marston’s Independent councillor, who has finally managed to secure adequate lighting for Croft Road Park, the cinder track continuing along the rear of Purcell Road. Everyone will be able to use this shortcut safely, avoiding traffic on this busy popular route at night and when the evenings draw in. TODAY, the Oxford Mail can reveal the first glimpse of what is planned for Oxford’s newest suburb. But artist’s impressions of what Barton West will look like, drawn up by development company Grosvenor, have divided opinion on the estate. Plans for the development have been in the pipeline for more than four years, but a planning application for the 885-home development was finally submitted to Oxford City Council last week. 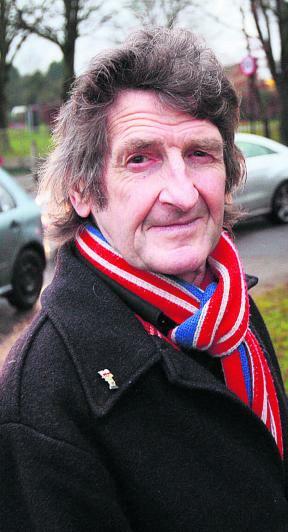 Barton resident Denis Samworth, 66, said: “It looks good but I don’t think it is for Barton. I think it is out of place. But Barton mum-of-four Jenifer Lukwiya said: “They look really good. We need houses, housing is a problem. Ed Skeates, the project director for Grosvenor, said: “There are a couple of key themes to the masterplan. First is connecting the existing Barton through to Northway. “There is a pretty strong middle street through the project, almost like a backbone, and off that there are smaller bones. “We have used a lot of the existing landscape of the site such as trees, hedges and ditches so the other theme is that it is verdant and green. The use of materials for the houses is a key element, having a limited palette so it is a recognisable development. Grosvenor said it does not know what materials will be used yet. Plans also include a primary school, a shop and a community hub. The artist’s impressions feature a Marks & Spencer Simply Food shop, although the details of specific stores have yet to be confirmed. In total there will be 673 houses – most of them with three bedrooms – and 212 apartments, mostly with two bedrooms. Forty per cent of these will be affordable housing. Grosvenor said it had avoided “pastiche”-style buildings and will have pitched roofs and “contemporary chimneys”. Its design code says the homes should be built from brick, render or natural stone. Front doors are to be of “contemporary design” in natural hardwood or painted timber with door numbers either in stainless steel or in-laid in a fixed side light. More than 900 people have registered their opposition to the Barton West Scheme. 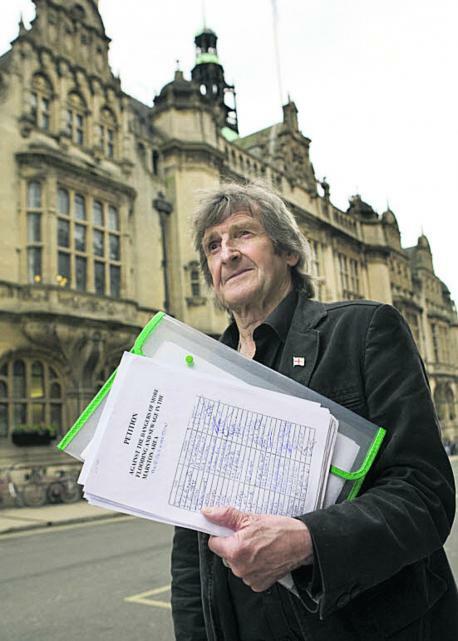 Mick Haines, city councillor for Marston, presented Oxford City Council with two petitions against the development and a traffic survey. A total of 935 people signed the first petition, which claims the development will make flooding and sewage problems in Marston worse. The second, which was concerned with an increase in traffic, was signed by 582 Marston residents. Mr Haines said: “I think proper infrastructure needs to be done on the houses before they start them. “We definitely need more houses, but we need the infrastructure solid before they are built. “Traffic is really bad and it won’t get better. It is going to be a catastrophe for Marston. Old Marston Parish Council chairman Charlie Haynes said: “I am quite aware that we need housing but the main concern on the parish council is that traffic will be generated to Marsh Lane and through the village. “It is bad enough as it is, let alone with the extra houses. “It will certainly have a severe effect on Old Marston and Marston. City councillor Colin Cook, the executive board member for city development, said: “Grosvenor have clearly put a lot of thought into coming up with an innovative design code for the Barton West development. The city council expects to make a decision on the Barton West planning application in September and, if approved, it could open in 2015. I am writing concerning The Insider, August 22, about the forthcoming by-election to fill the vacant seat left by Alan Armitage: Labour are putting up Louise Upton, whom I met at an Old Marston Parish Council meeting prior to the city elections of 2012. Living in Marston, Louise was fielded to fill the vacancy left by Councillor Beverley Hazell, but she was defeated by ever-popular independent Mick Haines who, after several attempts to be elected, was successful. Mr Haines carried on championing people’s causes, despite disappointment at the ballot box. He has earned his right to be a councillor where he still works tirelessly for those he represents – unlike some who you see at election time but hardly ever after, if at all. The point I am making is: how can Labour, or any other party, field a candidate in another area, having lost in an election in one area and never been heard of again, and expect to win a seat? It is all about winning seats to keep or increase a majority, regardless of how a candidate would perform in representing those who voted them in, but that’s politics for you. It’s a funny old game. 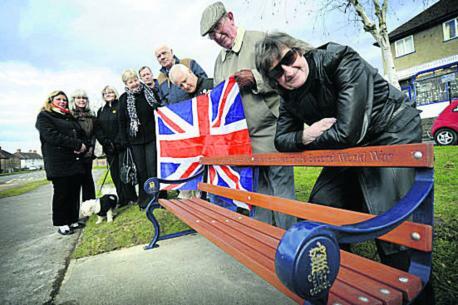 MARSTON residents have again vented their anger against Tesco’s plan for a car park where a war memorial bench sits. Tesco has had planning permission to convert the old Friar Pub site into a supermarket since June 2011 after it was approved on appeal. In the planning application, there are plans to create a “parking lay-by approximately 28m in length limited to a one-hour maximum stay” on a piece of green space in front of the Allegro Saxophone shop and Trev’s barber shop. In March 2013, a memorial bench was put on the green space to honour the 27 men from the parish killed during the Second World War. A plaque was also put up in October 2012 during a ceremony where the vicar read out the names of those who had died. Money for the new bench and plaque came from Marston city councillor Mick Haines’s community grant fund. Mr Haynes said: “If Tesco try to go ahead with this car park, there will be a big residents’ uprising. It will be shocking if they try to do this and disrespectful to those who died in the war. Roger Baycock, who runs the saxophone shop opposite the site and in front of the proposed car park, said: “I am absolutely furious about it – there’s been no consultation whatsoever. I don’t see why we should be subjected to this. Work is still yet to begin on the site and in May 2013 Tesco said work will not start until next year at the earliest. 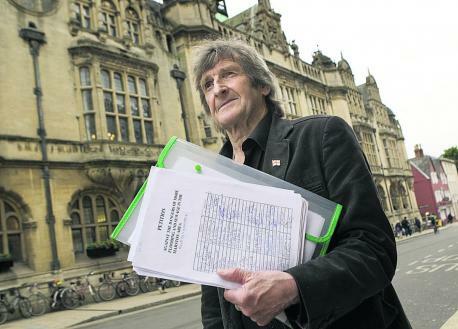 Tesco’s planning permission expires in early June 2014 but for Oxford City Council to refuse an extension there would have to have been a significant change in circumstances in the meantime. Tesco was unavailable for comment. IT seems to have taken forever but the lighting for Croft Road recreation ground, in Marston, is finally going to be installed. City councillor for Marston, Mick Haines, pictured, is a community campaigner who has been fighting to get this lighting since 2006, when the street sports play area was put in the rec’. In 2006/2007 Mr Haines was in touch with John Wade, parks manager at that time, and was told that a costing had been achieved of £28,000 for the lighting, £5,000 for the electricity cable and a sum of £600 per annum to maintain it. The money for the lighting was available in 2009 and was to be installed in July that year. However, a greater scheme to include lighting behind Purcell Road and improvements to the pathway across the rec’ and bridges at each end, delayed the lighting, although Roy Darke was reported to have said that it would be installed by the winter of that year. The residents of Purcell Road were upset, as they were reported as to be spoilsports by objecting to the lighting behind their homes. A later survey by Mr Haines revealed that there were, in fact, only two objectors. Frustrated by continual excuses for delaying the lighting, Mr Haines amassed a petition of more than 1,200 signatures for the lighting and presented it to 10 Downing Street, in 2010. It took a further 18 months to March 2012 before the lighting was approved. Mr Haines is very pleased that the lighting is to be done. He is also delighted with the other alterations to the path and bridges which fellow ward councillor Mary Clarkson has pushed for. It is good to see that councillors can work side by side to achieve a satisfactory outcome which can benefit all those who use the cycle track/pathway. ON May 25, 2010, the Headington Subway on the busy London Road was filled in and replaced with a crossing. It was built in 1970 and provided a safe way of crossing and kept the traffic flowing. The mothers, young children and the older generations loved the murals of the Headington shops, Narnia and the Shark House, which decorated the walls of the subway. The subway was part of the history of Headington and now that it’s gone, the traffic is gridlocked at certain times of the day and the situation is much worse. Yet another part of democracy gone in this city. MARSTON residents have been told they will have to wait another year before an “eyesore” in the area is redeveloped. The old Friar pub on the corner of Marston Road and Old Marston Road has been empty for around six years and supermarket giant Tesco has had permission to turn it into an Express store since 2011. But almost exactly two years after the company was given planning permission by a government inspector, work has yet to start. And now the supermarket giant has said it will not begin work until next year at the earliest. Crotch Crescent resident Eric Perkins said the community was “in limbo”. Mick Haines, city councillor for Marston, said: “As I have gone around the area, The Friar is the first thing people ask me about. Tesco’s planning permission expires in early June 2014 but for Oxford City Council to refuse an extension there would have to have been a significant change in circumstances in the meantime. The company purchased the 1930s pub from Oxford businessman Clinton Pugh in 2008 after his plans for an art-deco style block of shops and flats were turned down. Another former pub, the Fox and Hounds in Abingdon Road, is also sitting empty after Tesco was given planning permission to turn it into a shop last year. Tesco spokesman Beth Greenhouse said: “We fully intend to proceed with our plans for our store on Old Marston Road, creating 20 jobs for local people and providing customers with a range of fresh groceries and convenience goods. 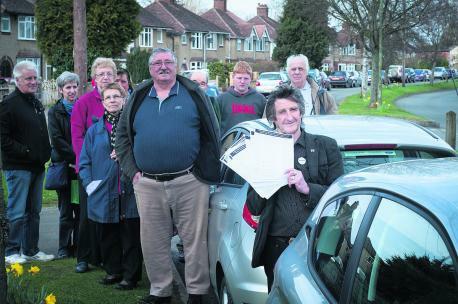 A CAMPAIGN to clamp down on inappropriate parking in Marston, Oxford, is gathering pace. More than 600 people have signed a petition calling for action from Oxfordshire County Council, Oxford Brookes University and the John Radcliffe Hospital. Residents claim students from Brookes and staff from the JR are clogging up their streets, sometimes blocking their drives. Retired university worker Malcolm Kitching, 72, of Lewell Avenue, said: “The roads around here were built in the 1950s when the buses and cars were thinner. They just can’t cope. “On Oxford Road, the buses can’t get through, the cars can’t get through, it’s an absolute nightmare. It’s mainly the Brookes students. If I go out at 10am and come back half an hour later, half the time I can’t park near my house. “I’ve got a drive and a white line across it which I had to pay £55 for, and they still park in front of it.” Marston city councillor Mick Haines, 72, is compiling the petition. He said: “It’s absolutely terrible and it’s been going on for years. Oxford University Hospitals Trust spokesman Kelly Dodgson said: “The trust works closely with the city and county councils to balance the needs to patients, visitors and staff to access our hospitals. Oxfordshire County Council spokesman Martin Crabtree said: “The county council is aware that parts of Marston do suffer from parking by non-residents. Some restrictions have been introduced in key hotspots. “We have had informal discussions with the parish council and would look at whether any local parking restrictions would be possible or effective. “However, there may be steps that the hospital and university could take to alleviate some of the problems residents are experiencing. Oxford Brookes spokesman Matthew Butler said the university encouraged students and staff to use public or alternative transport including the BrookesBus service.